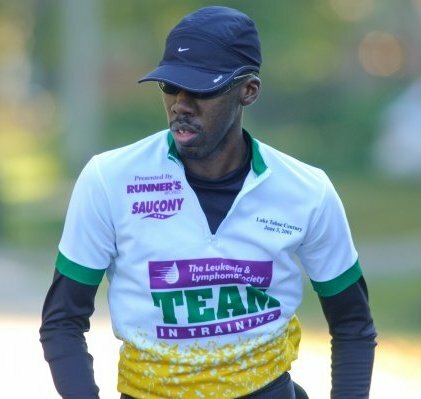 After an exciting year of moving up from “new runner” to finding out who I am and who I’d like to be in the running world, I’m looking toward bigger and better endeavors in 2012. 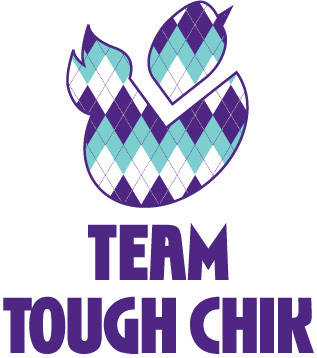 I’m excited to announce that one of those new adventures is that I’m now officially on Team Tough Chik. If the name Tough Chik sounds familiar, that’s because they also sell one of a kind running/cycling/triathlon clothes for ladies. I first started following them because I saw some of their shirts reviewed on a blog and thought how I’d love to have some of those super cute (I mean tough 😉 ) looking running shirts. In the picture below, I’m wearing the “I Run” shirt and love it! It’s super cute and very comfy. I also love the Tough Chik logo on the back shoulder! The small print says “This is what tough looks like.” I’m still stalking their page and waiting for their Tough Chik ball cap to be back in stock!! Team Tough Chik is made up of a group of more than 80 women from 5 different countries! We’re a mixture of running, cycling, swimming get-up-and-go’ers that have the honor of saying we’re the first team of this kind. We aren’t elites that had to follow a strict qualification to be a part of this team but I do think we all possess something special. This is all new for me because I was never on the track team or any kind of sports team growing up. I love that we are all different in our abilities but we have the same thing in common which is the love of our sport and being active. We have a page on Facebook where we’ve all been getting to know each other and I’m telling you, I’m in the company of some awesome chicks! We will be getting our race uniforms in March and I can’t wait! It’s going to be a blast to get to run and represent this group of tough ladies! I’m hoping that we might can even get a few of us together to participate in a race in my region (The South). Until then, I’m really enjoying the support and motivation that we’re getting from our daily posts. If you’d like to connect with Tough Chik and keep up with what’s new in their clothing line or read about what’s going on in their world, you can find them on their website here, Facebook and Twitter. Happy New Year! Make every day count! 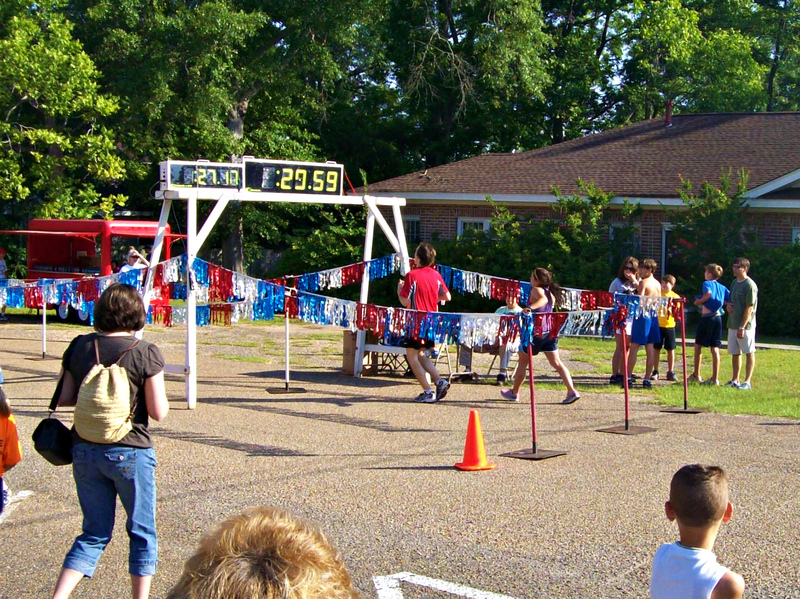 If you’re a runner or walker in Mississippi who makes the racing circuit, you’ve probably seen or at least heard of Rod’s Racers. 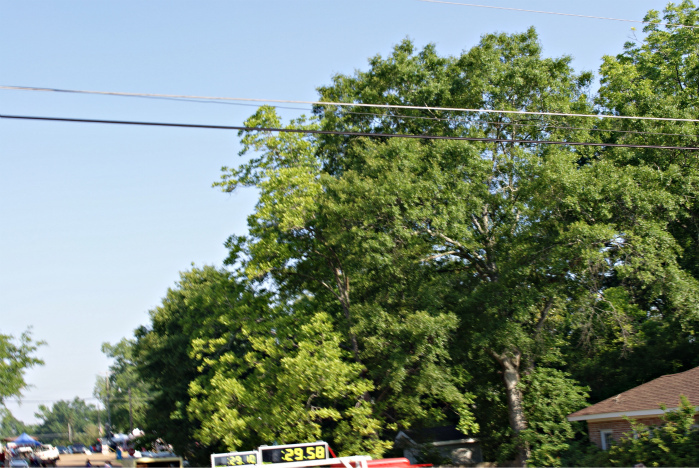 It doesn’t take long to realize that if you need information or pictures of you or a loved one in a local race, Rod Simmons is the person to contact. The best thing about this is that it’s free for you! 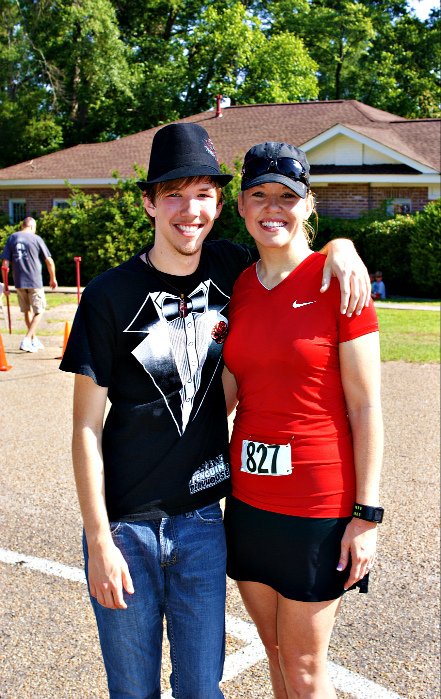 A few months ago, I decided to spotlight runners or walkers from Mississippi that are making an impact in our running communities. The first person that came to my mind was Rod. 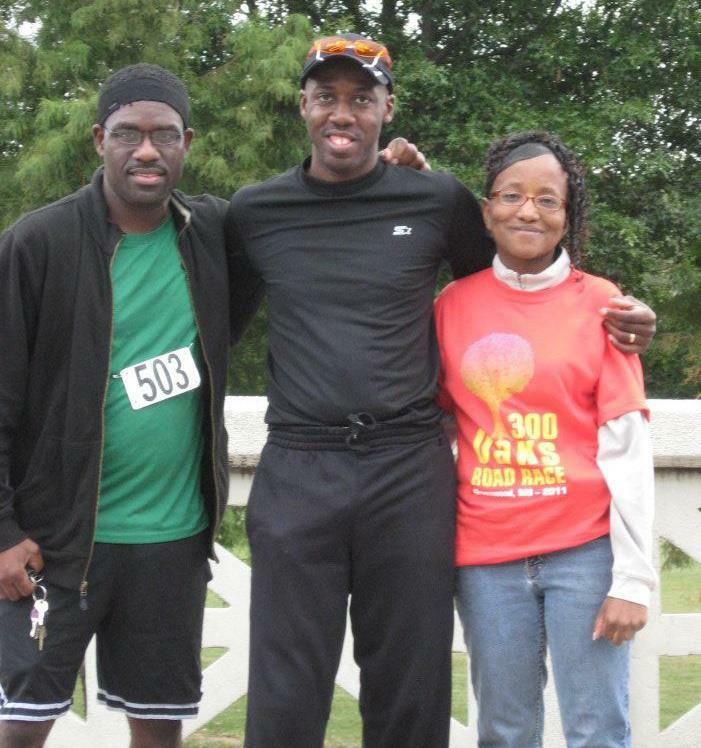 He works hard to not only promote races but also the importance of being healthy and active. I also believe that through Rod’s Racers, he’s brought a sense of camaraderie among the racers. 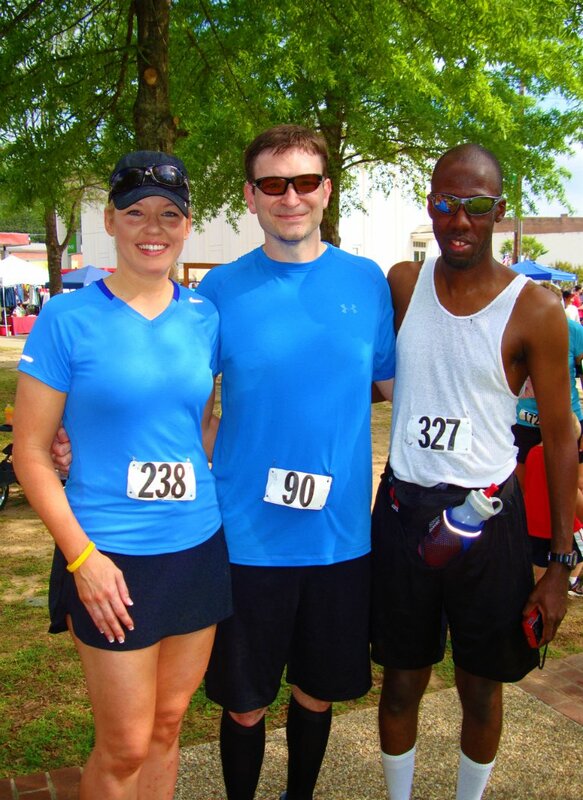 We met up with Rod at the Run for the Roses 5k Race in Prentiss back in April of this year. He is an extremely nice person who has an obvious love for this sport that only a runner/walker could understand. When he found out about my blog and Facebook page, he’s promoted it regularly amongst his many followers. 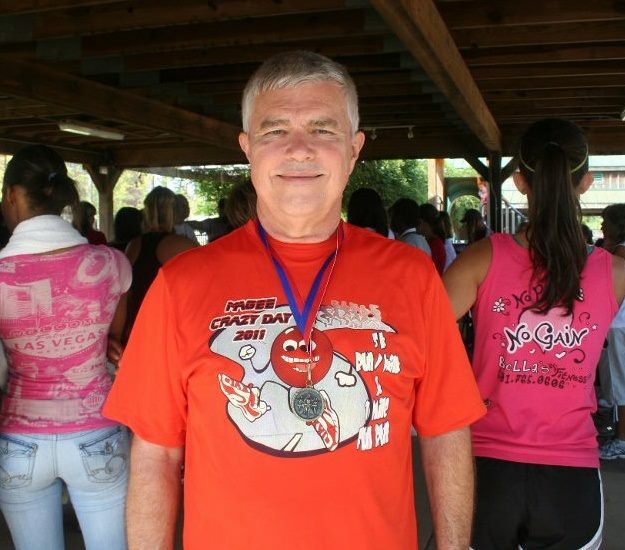 Rod was also my right hand man when I began planning my first 5k race as a race director. He also was more than ready to advertise it for me when we were ready to promote it. Rod was nice enough to stop and snap a picture with Jason and me. I really appreciate him taking the time out of his extremely busy schedule to answer a few questions to help you get to know him and about Rod’s Racers. 1. )Tell us about your family and work. I know April is at a lot of the races taking pictures and I’ve seen her race before too! April & I have been married for 14 yrs. Our daughter Roslyn is 12. I’ve been nursing at the University Of Ms Medical Center since 1995. 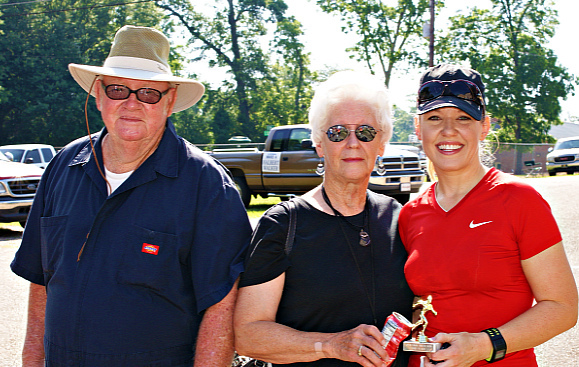 Rod with his wife April and a fellow racer at an event. 2. )How did you get started in running? 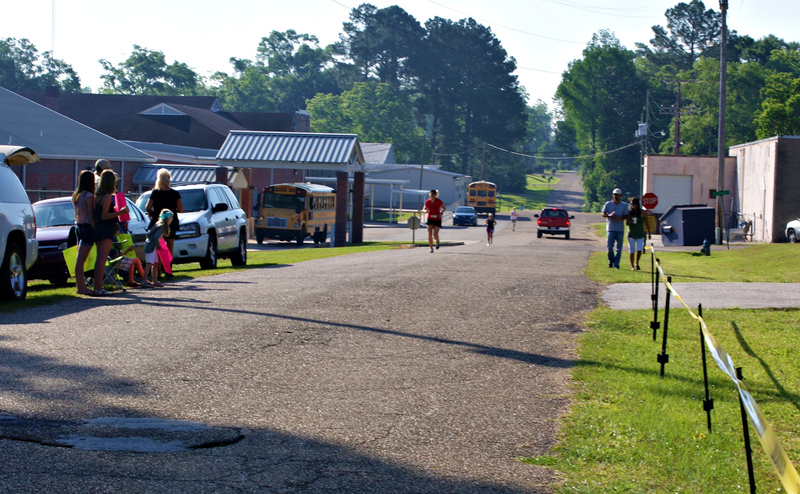 I started running in 1990 as a Sophomore at East Flora High School in Flora, Ms. I ran the 2 Mile for the track team that went on to finish the season as state champs that year. 3. )When did you start race walking? I started race walking in February 2009 after a 19 yr layoff from high school. My doctor gave me 3 months to chang my lifestyle after having repeat high cholesterol. 4.) Race walking looks so difficult! Do you find it to be harder than running? 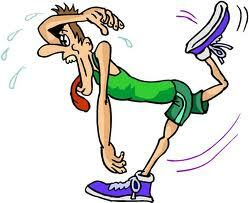 Race walking can be difficult. You have to be disciplined to be a walker. I love doing 8k or greater. 6.) 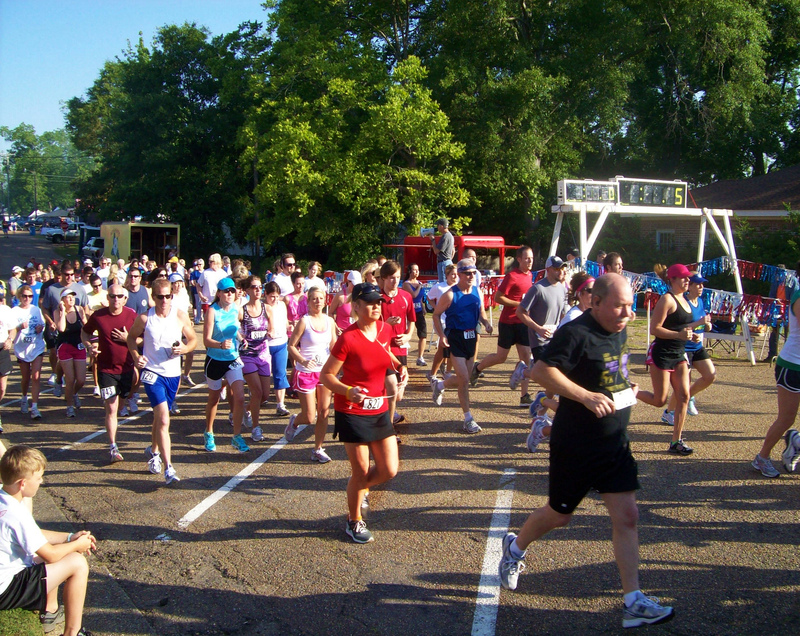 Do you have a favorite race that you look forward to every year? 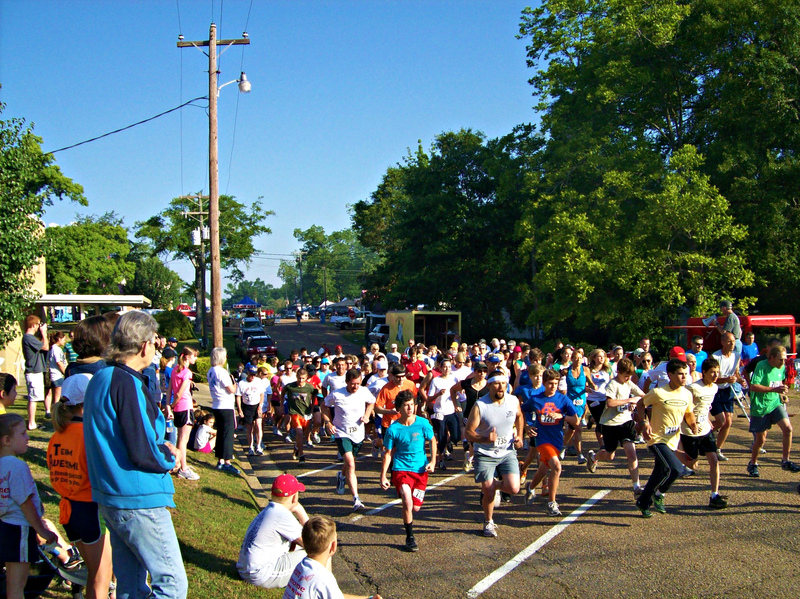 I enjoy Run 2 Eat 5k in Hattiesburg, YMCA Cotton Classic in Greenville & 300 Oaks Road Race 10k in Greenwood. 7. )What’s your best and worst racing experience? 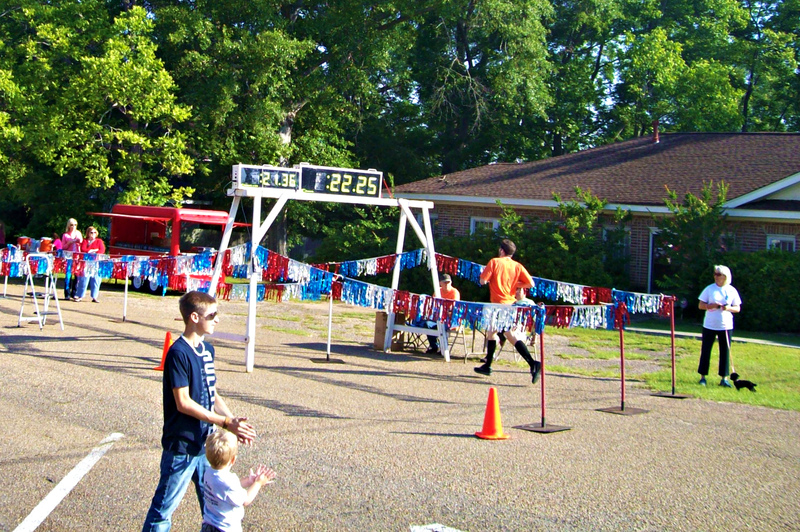 Best – When I PR’d in Oct 2009 with a finish time of 32:50. Worst – Sept 3, 2011. At 1/4 mile into the race, I hit the wall. All of my energy was gone but I still finished 4th overall in the walk. 8.) What’s an average training week for you? A training week varies based on my work schedule and the weather. 9.) Do you do any cross-training? I ride a mountain bike, stationary bike, elliptical machine, dumbbells, and strength training. 10.) What is Rod’s Racers and how/when did you decide to form this group? Rod’s Racers was started a year ago. 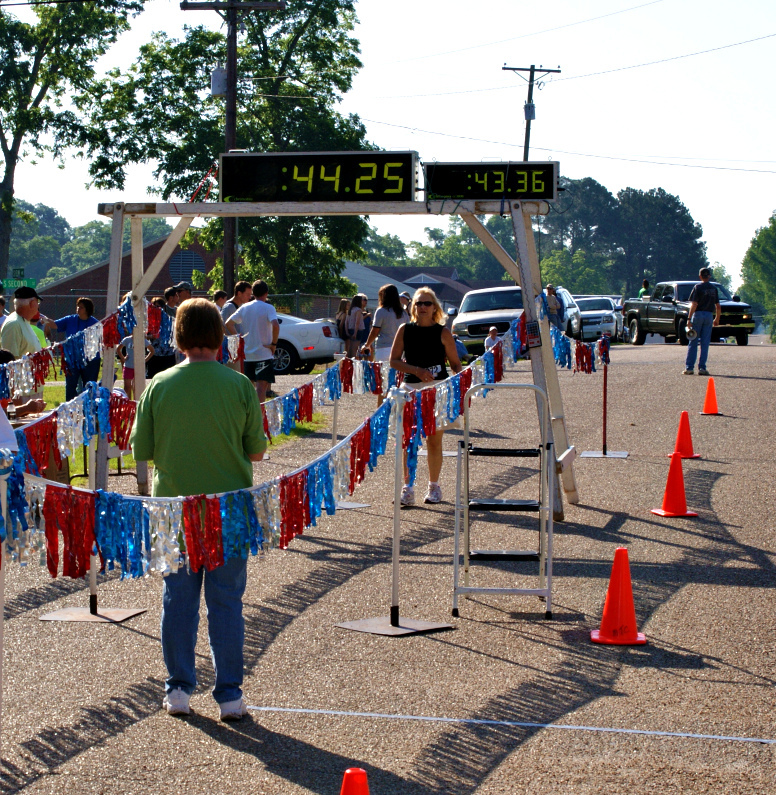 We promote road races in Mississippi. I want to help promote small races and support the race directors. We are made up of 5 people: My wife April does photos, Tim Irvine and Evelyn Watkins, from Meridian, cover East Mississippi, Frank Barrett, from Laurel, covers South Mississippi and takes photos. I am the founder and cover Central and North Mississippi. 11. 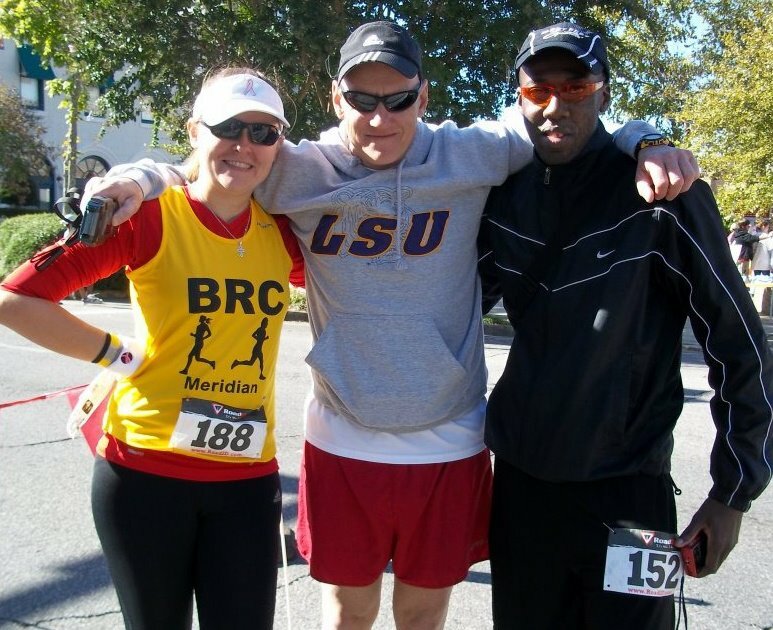 )How can runners, walkers or race directors connect with Rod’s Racers? 12.) What are your goals for Rod’s Racers? My goal is to create a chapter in each state to promote road races in those states. 13.) Approximately how many races do you/Rod’s Racers attend a year? 14. )If you could give someone advice that’s just starting out running or walking, what would you tell them? Always consult your doctor before starting out to be sure you’re healthy. Rod and his team do an outstanding job! Click the link on his logo below or give him a call if you need him at your next event or would like it promoted! Saturday marked the last “scheduled” race on our calendar until this Fall and what a race it was! This year there were 38 walkers and 109 runners participating – lots of fast ones too! Looks like I'm doing some kind of strange march here. The weather was really pleasant that morning, which was something we’d all been praying for (at least I know I had!). I started out a little faster than I should have but once I looked down and saw my pace, I reigned myself back in a bit because I knew I needed lots of energy until the end. This particular race course is no cake walk. It has lots of hills, some that are long, gradual ones that can wear you out if you aren’t ready for them. I actually felt like I handled the hills better that day than any other race that’s had hills before. I kept telling myself that my goals were this: 1. Finish 2. Beat my time from last year 3.Try and finish under 30 mins. 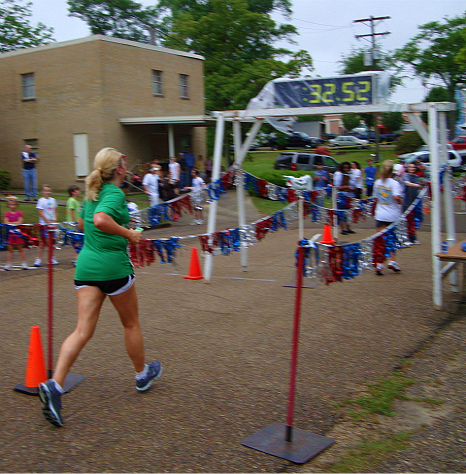 I decided that if I could obtain even 2 of those goals, I could go home saying it had been a good race. As I turned on to the street and topped the hill, I saw the clock and it was still under 30. I saw my parents cheering, I saw Jason’s mouth yelling (couldn’t hear what because my music was too loud) while he was frantically trying to take pictures of me. It was going to be close. I ran as hard as I think I’ve ever run in my whole life. The clock seemed to be ticking away so fast!!! One last look up as I approached the finish line and I saw 29:58. That was all I needed to see as I ran under the clock. I threw my arms up in the air. I’d made it!! As you can see, Jason was a little too excited and missed me. Luckily, he did get the clock in the picture! 🙂 I couldn't help but laugh at this one...had to post it! My mom did a great job of documenting everyone's finish that day! 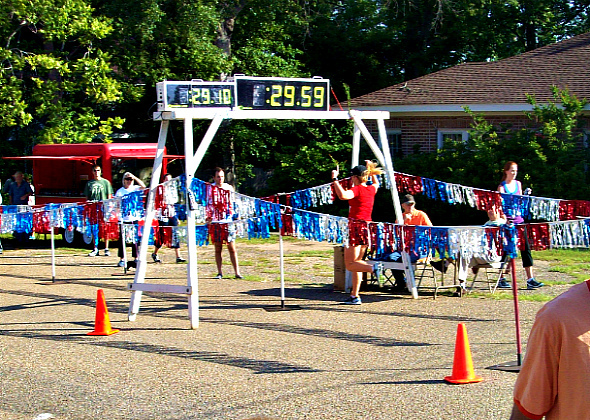 Jason finished in 22:27 and won first place in his age group! Jason running for the finish line! Several members of our family participated that day. Our son Tyler ran it in 28:01, Jason’s sister, Donna ran with a finish time of 31:02, his brother’s wife, Delana ran and finished in 27:45 (winning 1st in her age group too!) and his mom walked it in 43:37 (winning 1st in her age group!). Jason's mom heading towards the finish line. 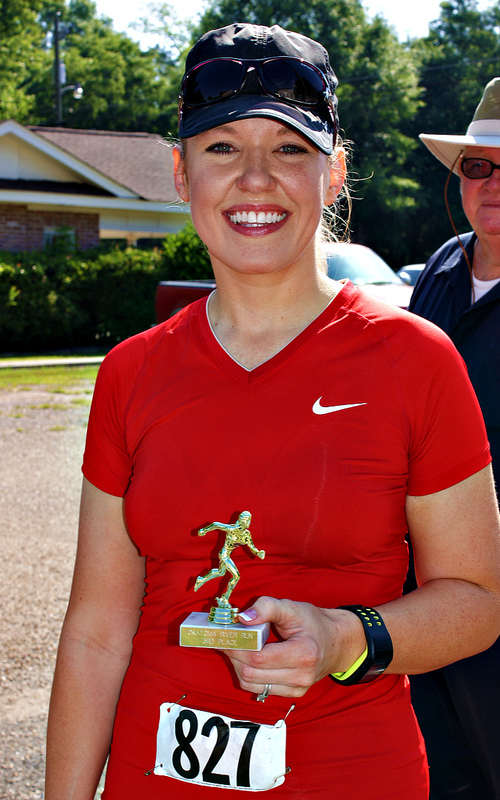 Click here for a complete list of results from the race, courtesy of the Mississippi Track Club. They always know how to put on a great race! I was very happy that several in our family participated and lots of our friends did too. Here's Jason with his sister, sister-in-law and mother after the race. I was super excited that my parents were there to watch me! Jason with his 1st place trophy. 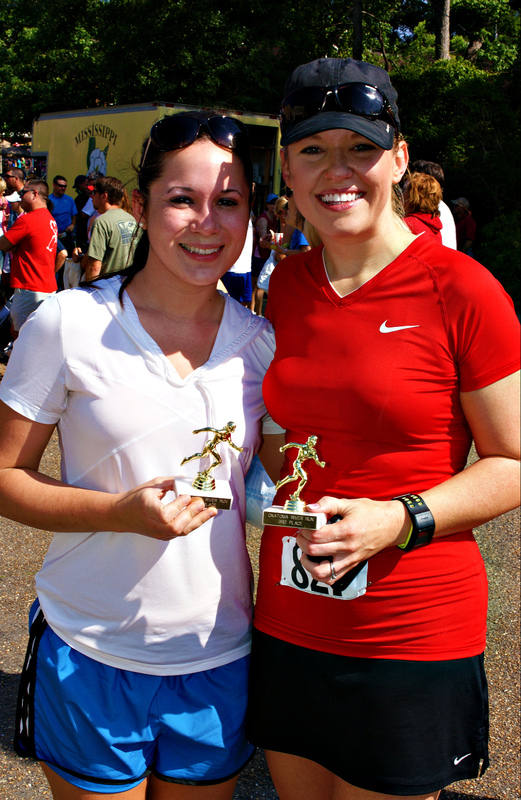 My sister-in-law, Delana with her 1st place trophy and me. 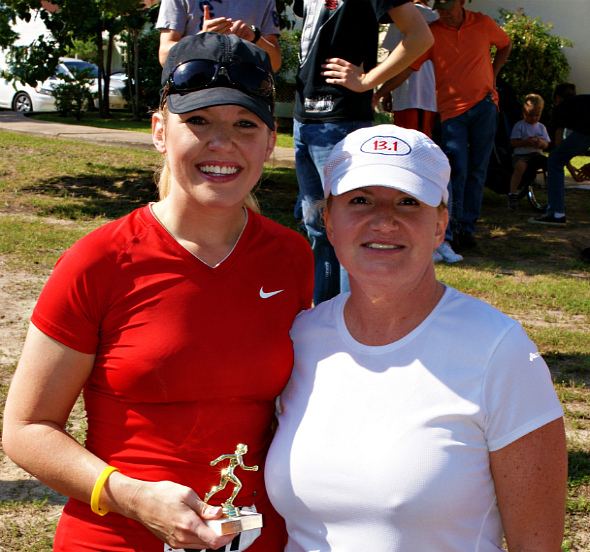 Here I am with Cherie who (beat the socks off me) won 1st Place in our age group with a time of 26:20! 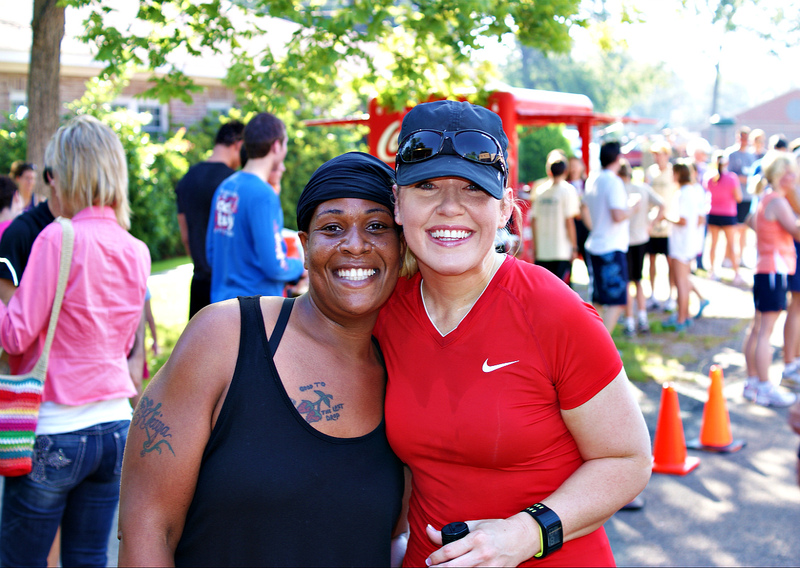 This is my friend, Lakeisha Barnes, who signed up this year as a runner in the race!! She has been on her own fitness journey in the last year and is one of the strongest, inspirational women I know! After being a bundle of nerves and not sleeping much the night before, and running behind that morning, I have to say that this year’s race was a drastic improvement over last year’s. Not being in pain is the biggest thing I’m thankful for but I’m also grateful that I’m a little bit faster too..or maybe just a little less slow! Third goal: Finish in under 30 – Almost – My official race time was listed as 30:01, even though I initially thought it was under 30. It’s ok though and you want to know why? Because I won my FIRST TROPHY with that time anyway!! 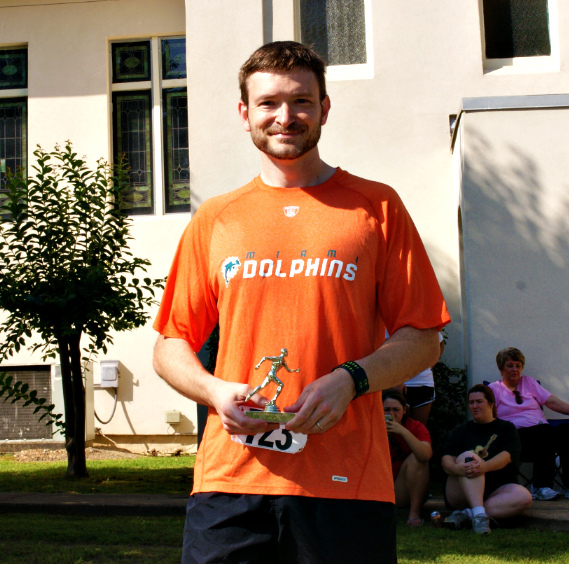 Holding my trophy for 3rd Place in my age group. Two out of 3, plus a trophy isn’t a bad day at all in my opinion!! 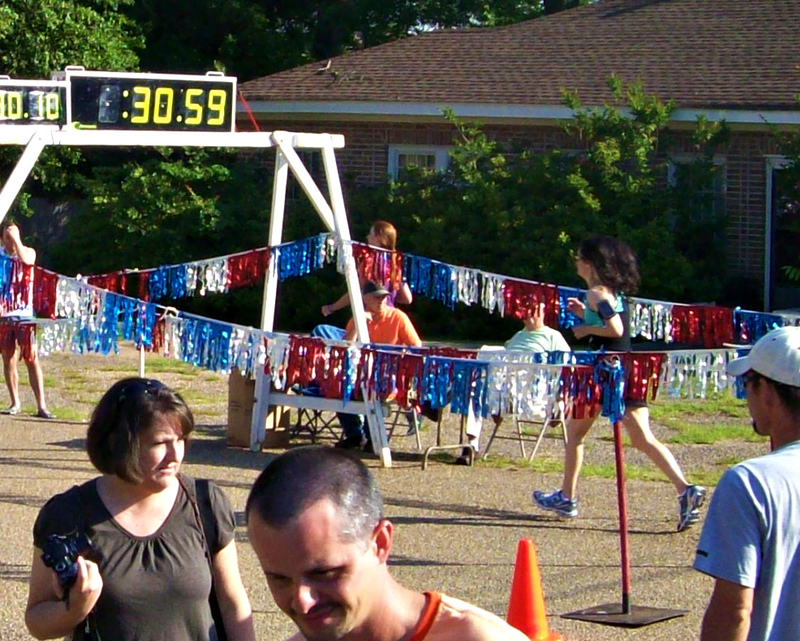 This is me finishing last year with an official time of 32:54. P.S. Look who I ran into after the race, talk about my lucky day! 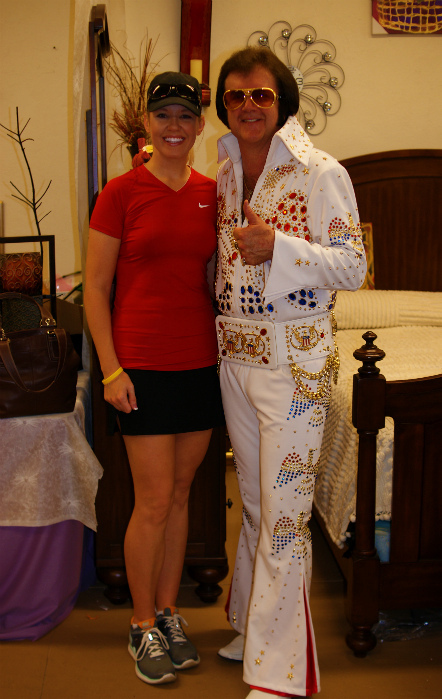 I was shopping for my mom a Mother's Day gift and Elvis just happened to walk in! 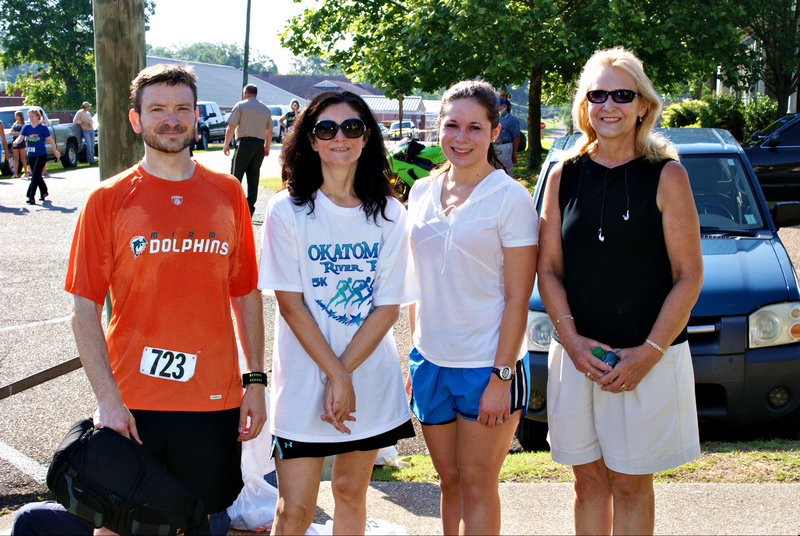 Okatoma 5k Race tomorrow – I think I can, I think I can! Here I sit on another race day eve and our vow to “go to bed as early as possible” seems to have fallen through…again. We have a sweet baby girl that seems to just know when there’s a race the next morning or if I need to go run, lol. Maybe she just doesn’t want to miss out on something exciting. 🙂 I guess it’s probably a good thing that we didn’t go to bed too early because I’d nearly forgotten to put my running clothes in the dryer. That would have been an unpleasant little surprise in the morning, especially if we’re running late. Besides trying out a new watch this week, I’ve also tried a new food. I bought Chia seeds yesterday after reading about them and learning how great they’re supposed to be for us. I ate some this morning mixed up in my oatmeal and then actually drank some in my water this afternoon. They aren’t bad at all! I did feel super full after drinking them but I think that’s part of what they’re supposed to do. No tummy problems to report and that’s always a good thing for me. Since today has been the first day of me eating them, I’ll let you know more about what I think of them as time goes by. Tomorrow isn’t just a race day, it’s also a huge milestone for Tyler. His first prom is tomorrow night! He also won a trophy in band on Monday night for most improved. It seems just like yesterday that he was Zach’s age, who by the way, graduated from K-4 last night! It’s been an exciting week and we’re so proud of both of them (and the rest of our children, of course). Time really does go by so fast…. I think it’s finally bedtime for us. Have a wonderful weekend!